The official end of I-78 is actually here in New York City, even though the freeway ends back in New Jersey. These four numbered exits are all on I-78 EB, which runs around a quick circle before dying; I-78 WB has no exits and is really just the outbound Holland Tunnel. Recently a new ramp was added between Exits 3 and 4 to ease the traffic building up at Laight St. Notice that the NY 9A shield has green, not black, numerals. 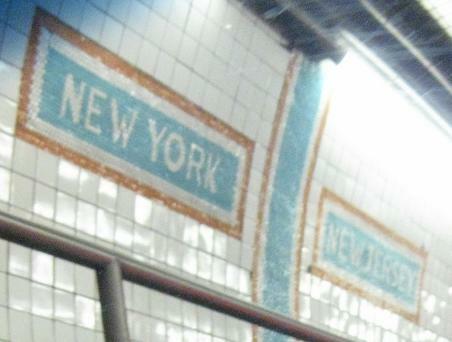 Holland Tunnel signs are white letters on a faded-looking mauve background. Apparently those letters are reflective. This is Canal St. WB, and by the appearance of the sign, the faded look may not be entirely intentional. Approaching the state line in the north (WB) tube. NJ 139 magically picks up at the state line, carrying I-78 through the infamous traffic lights at the west portal of the tunnel. Thankfully, the signals are timed to move through traffic as well as possible to the depressed NJ 139 freeway or the I-78 NJ Turnpike Newark Bay Extension. The left and right sides at the state line. 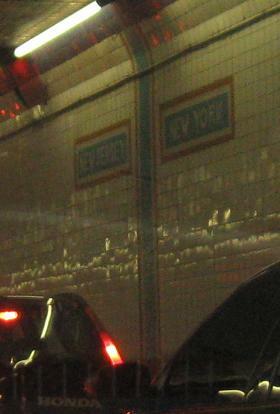 The little burgundy, white, and teal tiles are circles set in grout, much smaller than the regular tunnel tiles, configured to give an Art Deco look to the letters. The Tunnel tiles were restored in the late 1990's to make the tunnels bright white again, and maintenance has been much better since. I-78 was intended to go east from the Holland Tunnel, across the Williamsburg Bridge and through the heart of Brooklyn between Bushwick Ave. and Broadway (the proposed Bushwick Expressway). From there it would have used what's now NY 878 (and I-878), up an unbuilt freeway to I-295 (Clearview Expressway), and ending at I-95 - after having crossed 95 in New Jersey. East-west and north-south routes aren't supposed to cross more than once. Anyway, to get back on track, the rest of this page deals with a far-flung proposal in 1967 to revive the Lower Manhattan Expressway (LoMEx) after the freeway revolt movement (born right here in NYC) had killed any chance of completing I-78. 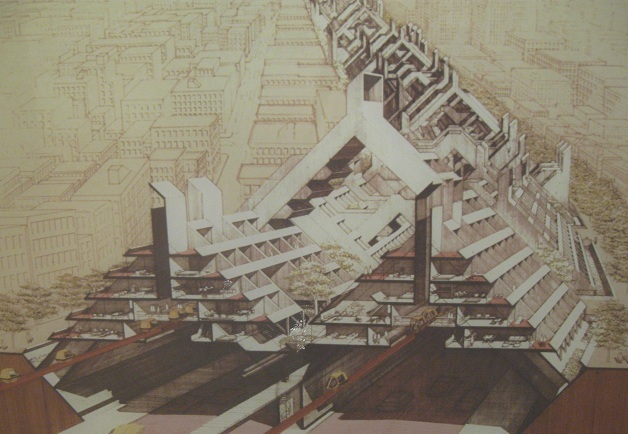 Born in the mind of Paul Rudolph, former dean of the Yale School of Architecture (he's an architect, that should tell you what to expect), the freeway underneath was secondary to the socially engineered, master-planned skyscrapers above. 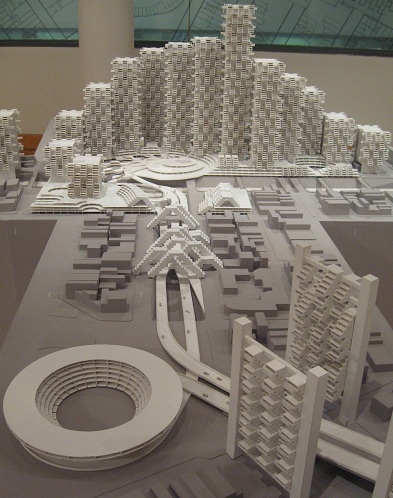 There would have been a spur connecting to the Manhattan Bridge, providing an excuse to demolish more blocks of neighborhoods and erect more New Age modular, angular cubic structures. 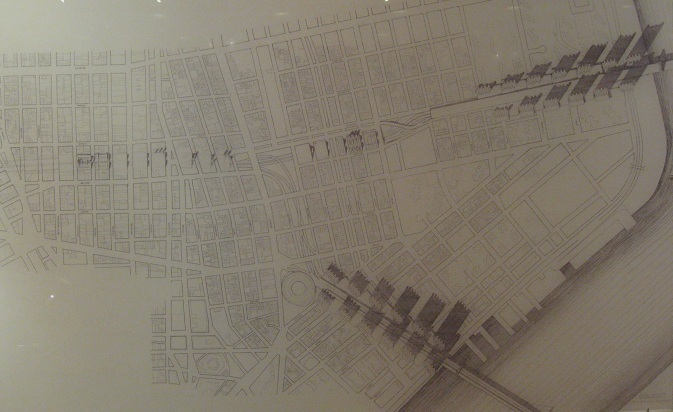 I learned all of this at the Cooper Union special exhibition in October-November 2010, where four years of engineering and architecture classes worked on researching Paul's drawings, sketches, and even scantier traces of ideas and created (by hand) a 3-dimensional representation of how an architect would design a highway before there was any concept of responsible design, only the knowledge that the current system of plowing through cities was broken. While I have no respect for a highway designed by an architect (and as you'll see, a lot of the ramps just don't connect to anything, or flip traffic backwards), I have tremendous respect for the work of the students to painstakingly put this together. 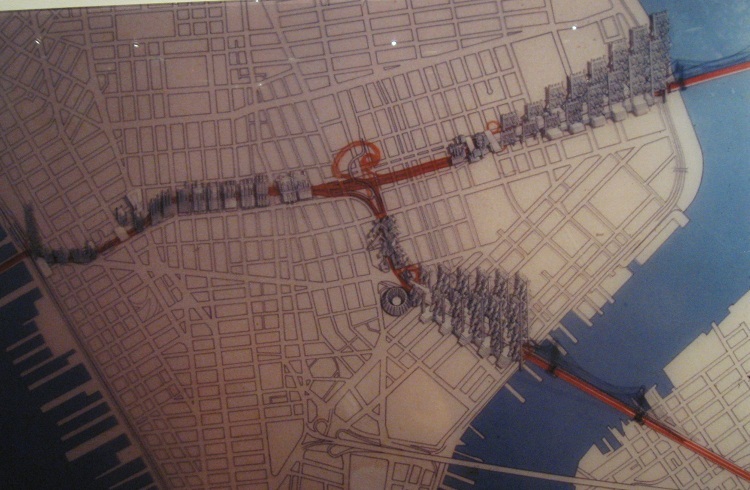 Rudolph's aerial sketches of lower Manhattan, with swirly things and roads to nowhere. So don't blame the students for misreading anything, it's plain as day wrong from the beginning. If you walked at surface level into the belly of the beast, there would be layer upon layer of innovation stacked on top of the freeway. 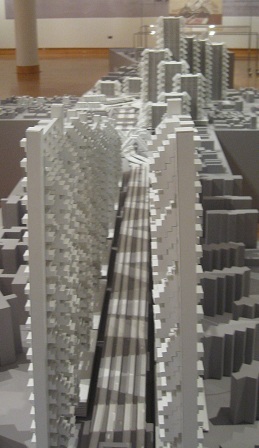 Somehow there would be people movers, functioning like individual monorails, connecting all of the dwellings and offices along the corridor. This one view of the people mover (in orange) doesn't suggest a very well-engineered design, taking amazingly long to get anywhere useful, but remember, it was drawn by an architect. 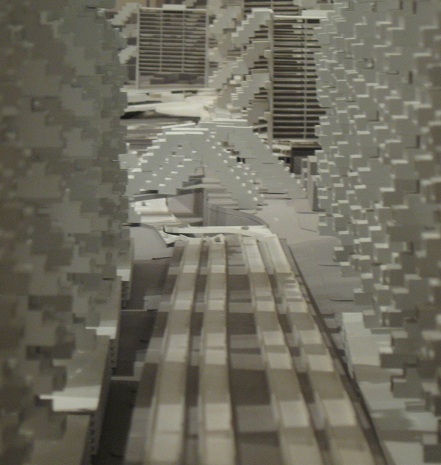 It's more of a scenic joyride, like the Disney skyway (which was one of the main inspirations for the concept). The other inspiration is supposedly the moving sidewalk displayed at the 1900 Paris Exhibition, although I prefer to think that that particular invention led more to things like airport walkways, things that actually have something in common. Maybe it was also inspired by watching the Jetsons on LSD. Let's ignore the building stacked directly on top of the right lane of the road. Let's also ignore that these buildings have no WALLS. I mean, it's just parking, cars will just stop, right? No need to, say, protect them from, say, falling off the edge? 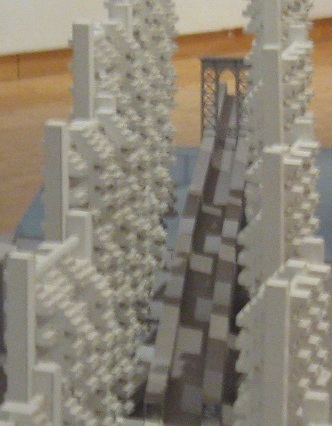 Another depiction of "life" along the corridor, looking east with the Williamsburg Bridge in the background. This must be an earlier plan, what with the rectangular parking down the middle and primitive depiction of connections to the four bridge roadways. 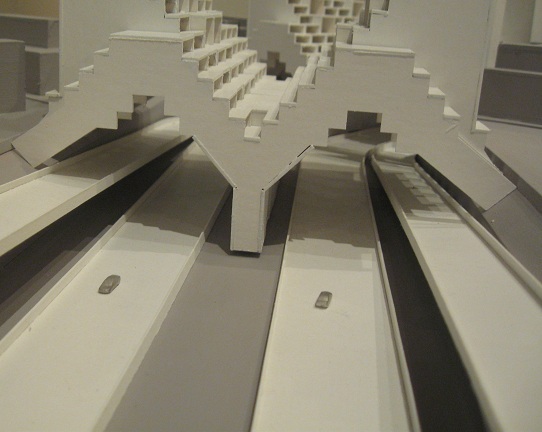 On the other hand, the "stairstep" building concept was retained in the final model, as you'll soon see. 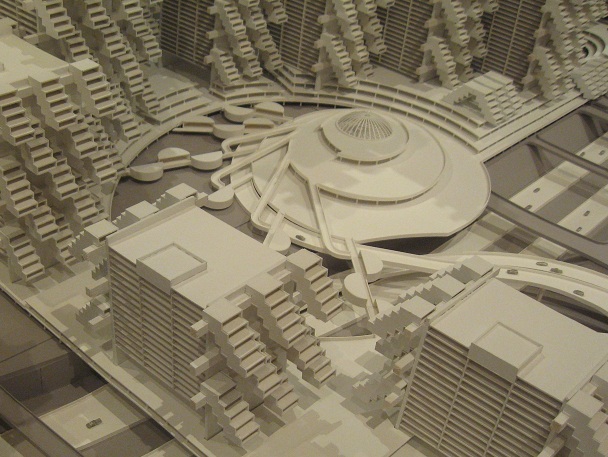 To transition from sketches to model, I'll start at the centerpiece of the concept, the HUB. Rudolph called it a "turnabout interchange," but I call it a failed Star Trek villain summoned to confuse civilizations into submission. 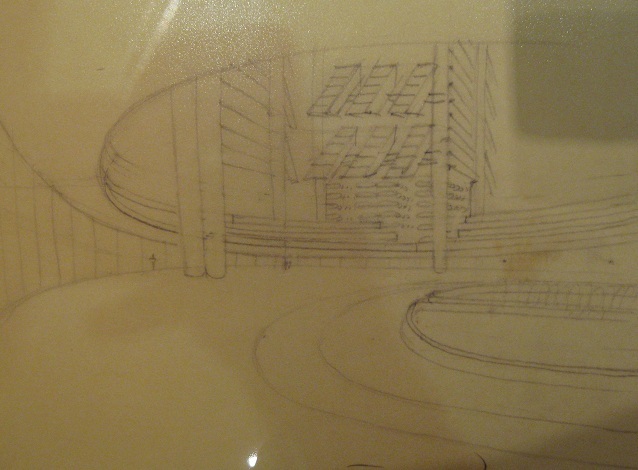 The original drawing doesn't even show any connection between the ground-level circle and the supposed ramps above. The best the students could do was create a spaceship and just throw some ramps inside it, close their eyes and pray people wouldn't notice. Actually, you may notice the one roadway that comes anywhere close to the turnabout stays outside it and exits out the other side. That makes it even harder to figure out how it's supposed to be an interchange. I just notice that there are ramps between the Manhattan Bridge and west toward the Holland Tunnel that do the job, so anything else is just an architect's dream and an engineer's nightmare. 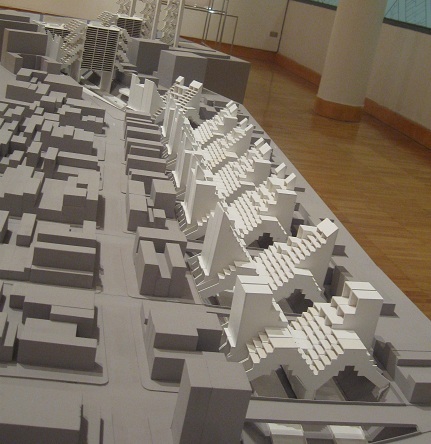 The two model photos look northeast and west. 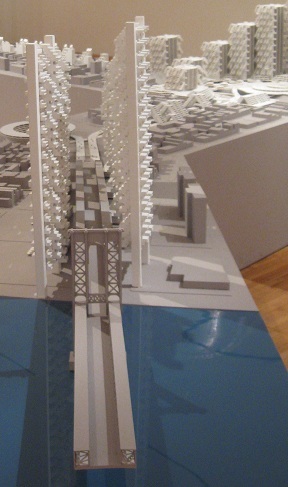 Now that we're in the model, here are photos north from the Manhattan Bridge toward the LoMEx. You may notice another random circular building with a ramp entering. In fact, there are two roadways exiting the circle (SB across the bridge, NB to the LoMEx), and the NB bridge roadway becomes the SB roadway from the other random circular building. This is why engineers and architects don't get along. 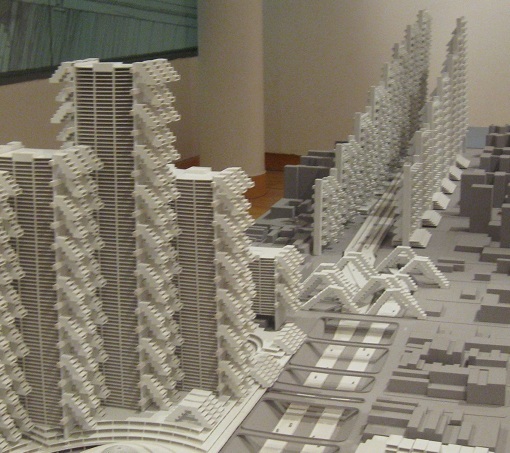 It also doesn't help that architects want to have 50-story modular buildings with no unique, iconic identity completely overshadowing a historic bridge that does have a unique, iconic identity. 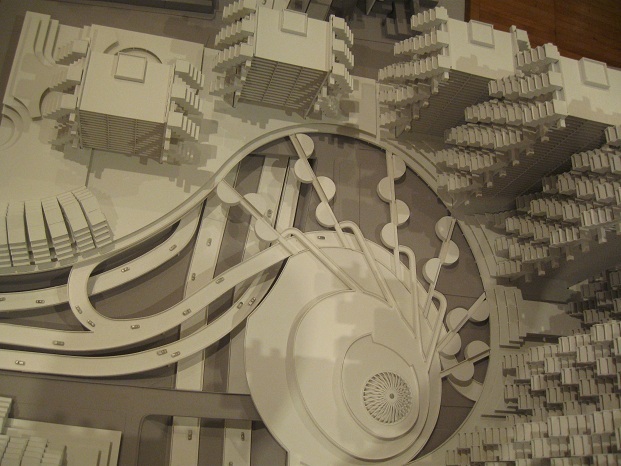 The one concept I do like is the little A-shaped buildings randomly spaced near the turnabout/starsquid. Why? Because they're the only thing Rudolph conceived that's on an appropriate scale compared to the rest of the city. Looking west from the Williamsburg Bridge is quite similar, again with the monstrous, teetering buildings drowning out any sense of proportion and ruining the bridge tower's aesthetics. Hey, look, a word that architects know. The buildings were conceived as a gateway on a "grand scale," stepping down as traffic drops into the city and providing "visual focus" (whatever) on the building "spine" across downtown. 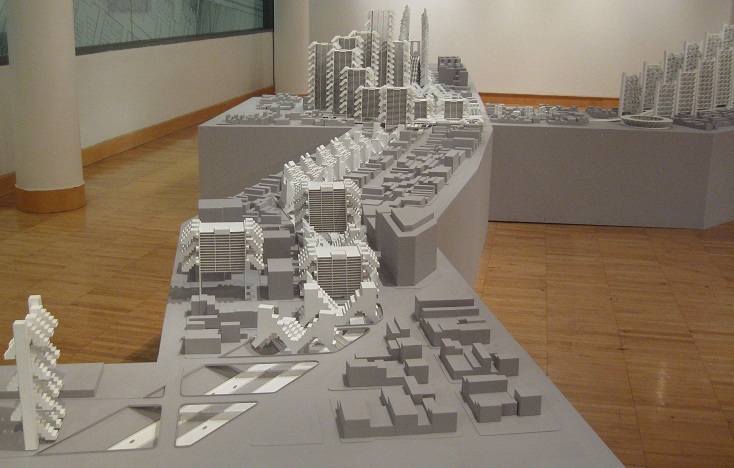 The tallest buildings would be offices, and then residences would start to appear farther west. If this concept seems remotely appealing to you, fill your screen with the third photo and grip something roughly wheel-shaped. Play some traffic radio and imagine this is your commute. Would it concern you that the inner and outer roadways never merge, so that 50% of traffic won't be able to get to the right destination? Would you feel at all claustrophobic? Would you miss the sunlight? Would you worry about one of the buildings falling down on you in a stiff zephyr? I think the primary concern is that the building modules will gain sentience and try to assimilate you into the Borg. Now looking eastbound in the vicinity of the HUB (isn't that a great Star Trek villain name?). The ramps for the Manhattan Bridge are intuitive enough, although I can't fathom why the EB-SB ramp would leave on the left while the EB-NB (or EB-HUB) ramp crosses under. I'm sure it adds visual focus to the aesthetics of the gateway. More EB views toward the Williamsburg Bridge, which you would no longer be able to see from anywhere in Manhattan other than due west if this came to pass. All of the diagonal modules hanging off the buildings in the foreground are living spaces, supposedly, though I wouldn't really want to live in something where I have to go up 5 stories (and somehow diagonal) to get from one end of my apartment/condo to the other. Nor would I want to live in something that hangs from the top and just swings out without any other anchoring. 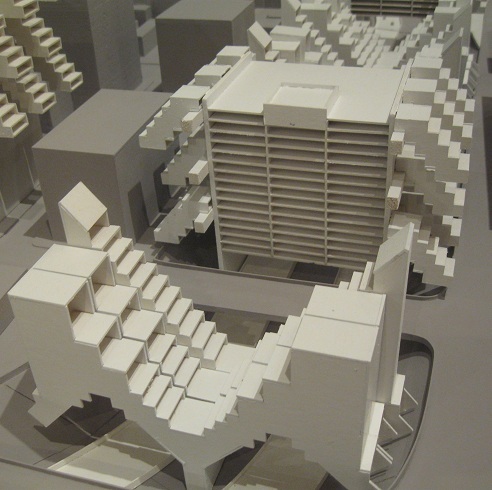 However, architects love this crap concept because the levels fold into each other and can be turned sideways to fit on an 18-wheeler. I wish I were making this up, but there were sketches. It's Transformers meets... well, architects, because architecture does scarier things than any sci fi creator can conceive. Looking west at the entrenched LoMEx hidden under the M-shaped buildings. 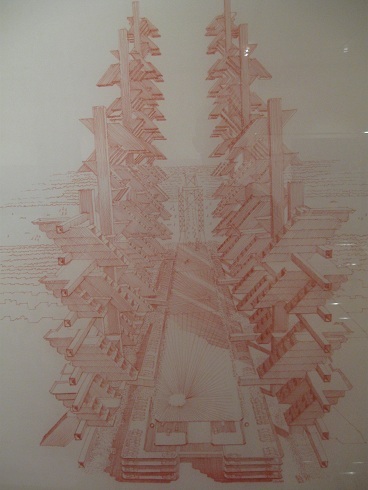 There are a lot of diagonals and stairsteps, so at least the "spine" buildings would have been visually connected to each other, if not anywhere else in the world let alone the city. 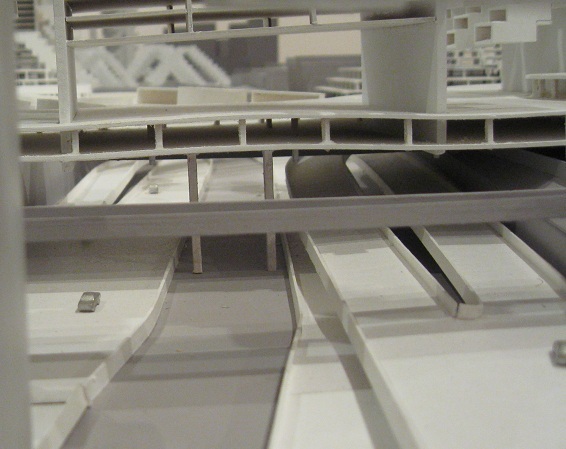 How quiet would it be to live above a freeway? What if there's an accident in the middle of the night, with multiple emergency vehicles (due to the high speeds and constrained conditions, any crash would be significant)? What if the only time a lane can be closed for maintenance is overnight, due to traffic, such that all the heavy equipment and massive moving is happening during sleepytime? Let's just leave those problems for the engineers to figure out, because this looks pretty. By the way, dollars to donuts that Rudolph never considered the massive amount of utility relocations and new utility service lines that would be needed for a concept like this. 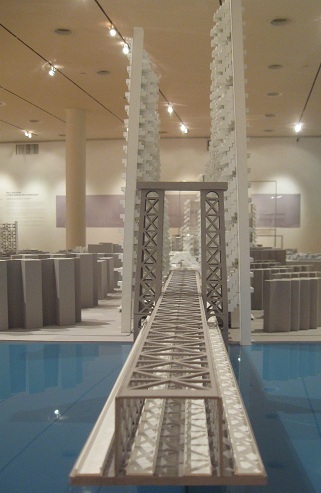 Almost the reverse of how I'd normally do a page, photos starting eastbound from the beginning of the expressway at the Holland Tunnel portal (now submerged under concrete and steel, or craft cardboard in the model as it were).